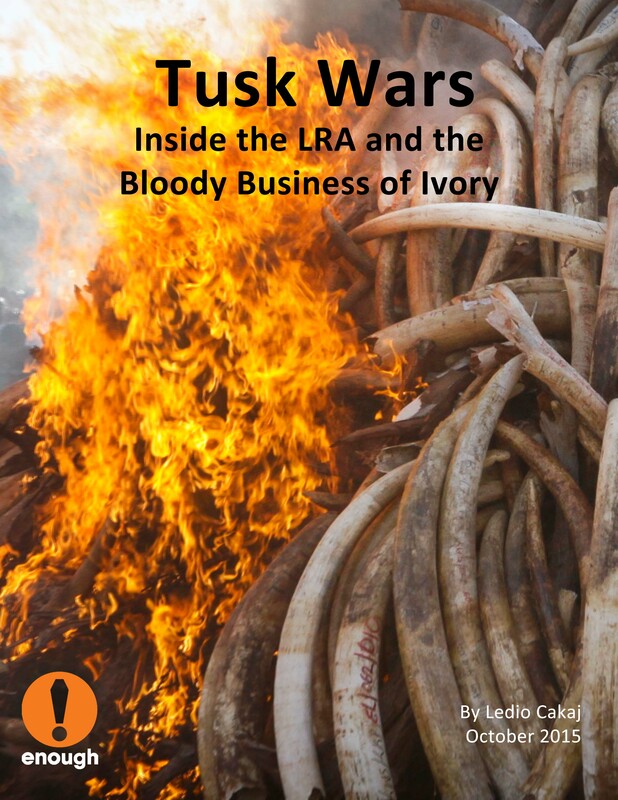 A new Enough Project report tracks how ivory trafficking funds LRA operations and perpetuates violence against civilians. While Joseph Kony’s Lord’s Resistance Army (LRA) is now significantly weakened and reduced in size, the LRA’s operations still pose a significant threat to communities in Central African Republic (CAR), the Democratic Republic of Congo (DRC), and South Sudan. Only 120 armed men remain in the LRA, in addition to 100 to 120 women and children. From January to August 2015, the LRA committed 150 attacks and 500 civilian abductions, according to the LRA Crisis Tracker. An estimated 200,000 civilians are displaced by the LRA and cannot safely return to their homes. Kony’s last known location in May 2015 was along the border of Sudan-controlled Kafia Kingi and CAR. In October 2015 President Obama renewed the U.S. mission assisting the African Union in countering the LRA for one more year. The LRA’s system of ivory trafficking continues to finance its operations. Recent defectors from Kony’s group have emerged with large amounts of fresh ammunition that was obtained by trafficking ivory. Garamba National Park in DRC is the epicenter of most regional elephant poaching, seeing the elephant population decrease from about 20,000 in the 1980s to around 1,000 in 2015. LRA poaching operations in the park also pose a serious danger to local civilians and the park rangers, who call the situation an “open war.” From the park, ivory is often transported through DRC and CAR to Sudan, where it is transferred to Sudanese merchants and at times directly to Sudan Armed Forces officers. The ivory is then likely transferred to Khartoum, the capital of Sudan, where it is mainly exported, most frequently to Asia. For additional recommendations and more information on the following, read the “Tusk Wars” report. The U.S. advisors mission should ensure their primary goal is to bring Joseph Kony to justice. The mission should also provide additional airlift capacity to the regional task force it supports and increase its programs to entice LRA fighters to defect. Congress should support the recent reauthorization of the counter-LRA mission with adequate funding through Fiscal Year 2016 appropriations process. The U.S. should increase technical and financial support to Garamba National Park Rangers. U.S. Courts, and those in the EU and elsewhere, with jurisdiction over individuals and companies suspected of high-level involvement in illegal ivory trafficking, should investigate the most serious cases of trafficking, natural resource pillage, money laundering, and other related crimes. The U.S. should press Sudan to allow troops of the African Union Regional Task Force (AU-RTF) access to Kafia Kingi to pursue Joseph Kony and remaining LRA groups. Write to your Members of Congress and urge them to support Global Anti-Wildlife Trafficking Legislation.